The pattern is Drachenfels by Melanie Berg, just a simple garter stitch shawl with some interesting color patterning. It’s knit out of 3 skeins of Sebago from Knit One Crochet Too that I bought for the project, one skein of yarn from Straightfork Farm in the Gold Rush colorway (bought at Twinset Summer Camp in 2013), and a skein of my own handspun carbonized bamboo, plied up sometime this spring. On size 6 needles, it whipped up really fast, and then it grew by another 60% when I blocked it (that’s alpaca for you…). It was interesting that the alpaca slipped and grew immediately once wet, but the carbonized bamboo took some coaxing to stretch to the same gauge. Different textures, different behaviors. It’s about 5″ along a side, so it’s a pretty generous shawl. I was a bit put out with the triangle’s hypotenuse: I made a point to leave some extra give in the edge stitches, but the increases called for in the pattern make for a very tight, inflexible edge that didn’t stretch well at all. You can see that it’s still slightly puckered in the photo above, and that was after serious stretching while wet – it looks worse in person. It does bother me that the edge gauge is so different than the rest of the shawl, but I don’t think it will show up when worn. Still, if I were to knit this pattern again I would absolutely choose a different increase technique. The drape of the fabric is really nice, and I absolutely love the color. I am not usually a yellow person at all, but I fell in love with this skein when I saw it, and I like it even better offset by the black and charcoal gray. I hope to take a modeled shot that does it justice one of these days, but in the interests of posting, best to go with what’s on the camera now. I only have another 6″ or so to go on the green shawl, so I am perilously close to being out of knitting again. Lest I break this run of actual project progress, we made a run up to Coveted Yarn this morning in search of new supplies. I started my summer internship two weeks ago, and promptly realized that my dressy office wardrobe is mostly blue, and almost none of my current knitted wardrobe seems to match. I’ve kind of wandered off into the purples and oranges in the past few years, and haven’t refreshed the blue department very often lately. 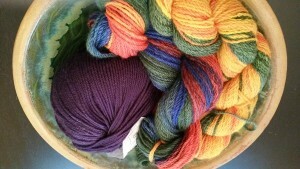 I also got some purple Cascade 220 to go with these bright gradient skeins that I hand spindled in Germany in 2009. I haven’t decided 100% on the final project for this one yet, but at the moment I’m thinking it will also be another garter stitch shawl. Easy to get off the needles quickly, and maybe by the time I finish this one I’ll have come up with a more adventurous project for the summer. So, there you have it. One shawl done, two almost begun. It seems I have not forgotten how to knit, after all. So happy you haven’t forgotten how to knit!! Your schedule is so busy that I’m surprised you have time for anything extra. 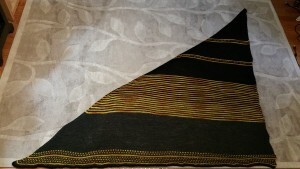 The yellow does provide a great deal of pop on the shawl. The shawl looks lovely but I’d like to see a close up of it. 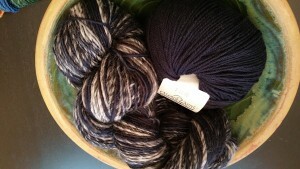 I just love making those shawls and have a Stephen West lined up now with Louet Merlin in lots of colors. Still dealing with major stash but I’m saving my 2 skeins of yellow for something special. Hah – you forgetting how to knit! What I’m really tracking is how many of someone else’s patterns you are knitting. All great choices, all nicely done, all an indication of just how full and engaged your brain is in your program. DesigKnit is powered by	WordPress 4.8.9 . Page generated in 0.293 seconds using 36 queries.